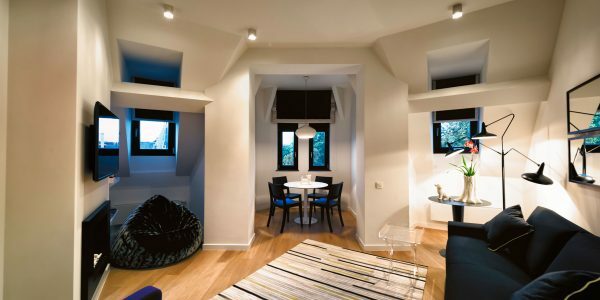 Bright and design 65m² apartment with one bedroom, an additional high-quality sofa bed, one bathroom, a large terrace and separate kitchen area. At the corner of Square Ambiorix, this elegant apartment has entrance through a charming little front yard. Designed for your comfort, the high-quality sofa bed can host up to two guests in the living room for families, friends needing extra space. The kitchen side has access to a wide terrace that benefits from good natural light – offering you pleasant moments in quiet and peace. The living room benefits from a stunning view of a green park throughout tall double gaze windows. With its refined contemporary aspect, the apartment is dominated by the great mix of colour – and has nonetheless – preserved the building’s authentic charm with typical alcoves – which brings comfort and elegance in mind. You will have the opportunity to enjoy a relaxing evening on a large convertible sofa in front of a film – among various international channels. 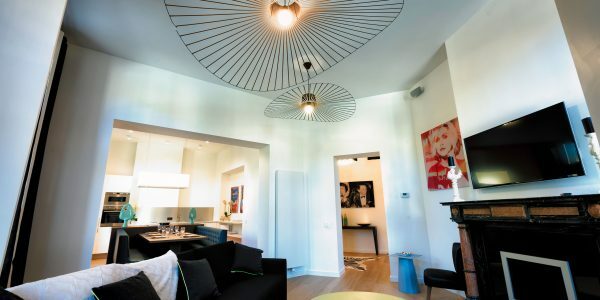 The flat includes high speed wireless internet, a fully-equipped living room with sofa bed, additional seating, cabled flat-screen television / Bose Hi-fi speakers and a cosy original decorative fireplace. The bedroom with queen size bed has wardrobes with hanging space, flat-screen TV and a designed cubical bathroom with an Italian shower and toilets.